All Cal Window Rubbers for Bugs and Type 3. These window rubbers are available individual or in kit forms. Bug kit consists of (4)Windshield, Rear Window and 2 Rear Quarter Windows. 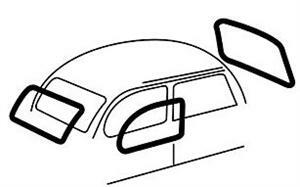 Type 3 kit Consists of (4) Windshild, Rear window and Sides. Click on product options to choose your kit or individual piece needed.